Opposites rule at Jaa Chocolates. Try their unusual combinations of dark chocolate and Indian spices, including Banarasi Paan Chocolates, Chilli With Almond Flakes and Cashew Chikki Chocolates. Chocolate connoisseurs, get ready to let your taste buds experience one-of-a-kind combinations of dark chocolate along with traditional Indian flavours and spices! Say 'yaa' to Jaa Chocolates by Kavita Raheja - they're homemade (and made with love! ), and created using the finest natural ingredients. 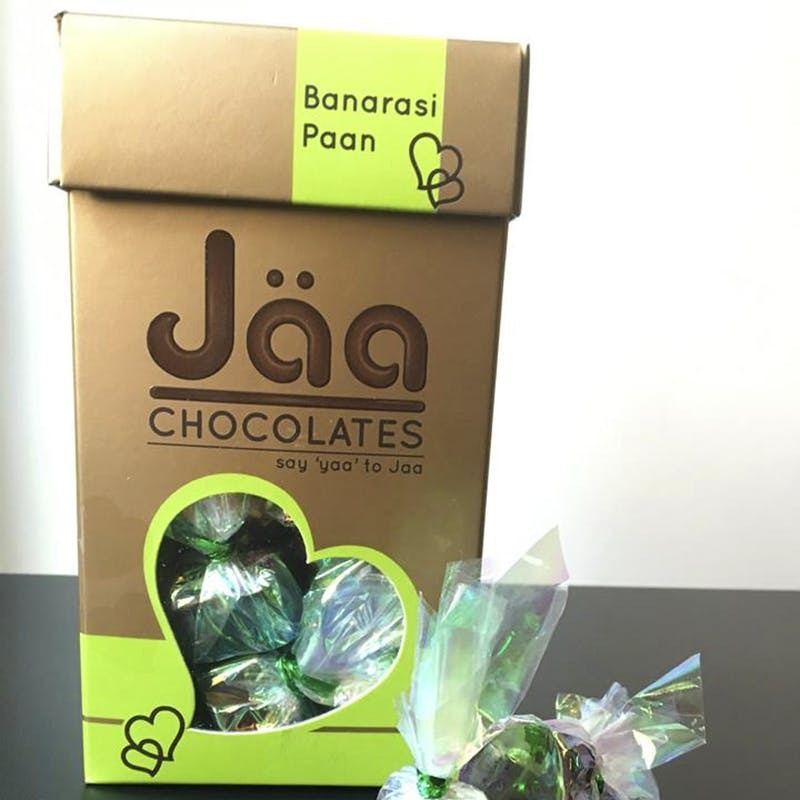 Paan lovers, you will enjoy their Kolkata Paan Chocolates, a delicious mix of dark chocolate along with the sweet dried glazed cherry from the paan. Up for trying a stronger flavour? We recommend the Banarasi Paan Chocolate. Pop one in your mouth and taste the intoxicating blend of betel leaves and fennel seeds - it tastes like Banaras in chocolate form! There's also the super-crunchy Cashew Chikki Chocolate, perfect for a cheat day indulgence. Most of the ingredients in Jaa chocolates are made from scratch (including the Chikki) and prices start from INR 400 for 20 pieces. If you want to order in bulk (surprise your wedding guests with Banarasi paan chocolates! ), just reach out to Kavita and she will custom make it for you. Brave enough to try something super-unusual? Try their Chilli Chocolates With Almond Flakes and experience a rush of sweet and spice, all at once. We guarantee, you won’t regret it! You’ll also find Pumpkin Seeds With Sea Salt, for a truly magical chocolatey experience. Just looking for the classics? They have Rum Chocolates and Almond Drops too. While you can order from their website, Jaa chocolates are also available on Big Basket and Amazon. Plus, they take orders on WhatsApp and can Dunzo your order to your doorstep. If you're outside Bangalore, Kavita can even courier the chocolates to you.